Singapore is a very exotic and fairly popular destination to travel to. The Asian sovereign city-state is located in Southeast Asia and is known as the Red Little Dot. Its beauty and breathtaking nature are the reason why people travel across the world to just witness this miracle of nature. But aside of being absolutely stunning and interesting for explorers and adventurers, Singapore has a nightlife that a lot of countries around the world can envy for. Because of its picturesque landscapes and great economy, also known as one of the Four Asian Tigers, Singapore offers you a once in a lifetime experience if you happen to hop on the bandwagon. 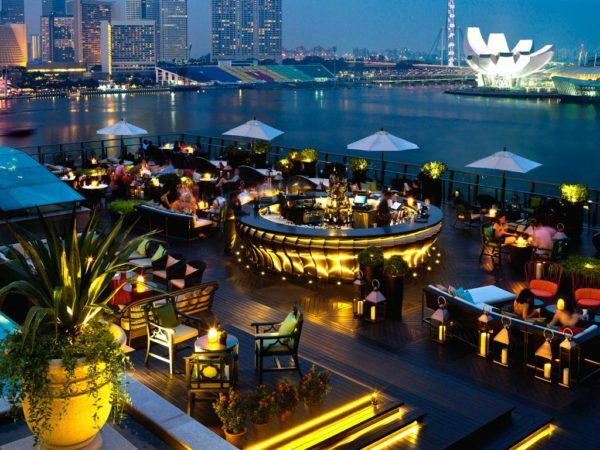 Today we will introduce you the 15 best rooftop bars in Singapore without any particular order. 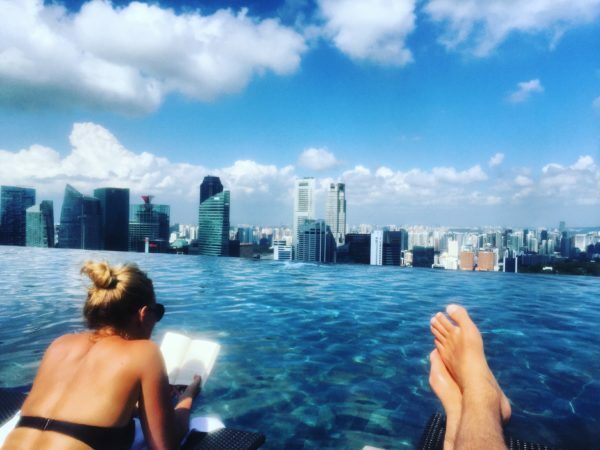 And here you can find all rooftop bars in Singapore. Proud runner-up for the “Top 50 Bars in the World”, as well as being one of the oldest rooftop places to visit, New Asia Bar opens up its doors to invite you to a place, where your adventurous and party spirit can indulge on a cocktail. The menu list is relatively inexpensive. Being on the 71st floor above the civil district, New Asia Bar is a common location for live DJ sets during the weekends. Inspired by the Japanese culture, Kinki’s vibe is what people call a modern mixture. Its menu is based on traditional Japanese food, including great sushi and sashimi. While indulging on a divine bite of food, you get the feeling of being in a funky and modern place because of the graffiti surrounding on the walls. The bar is located right next to the CBD skyline markets. A reservation is required on the weekends. 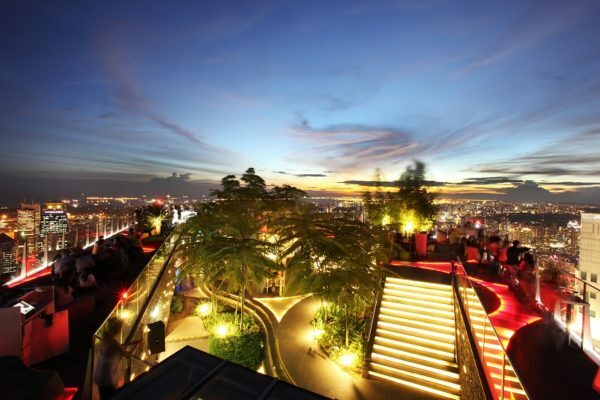 The top of the top, Ce La Vi, formerly known as KU DE TA, is one of the 15 best rooftop bars in Singapore. 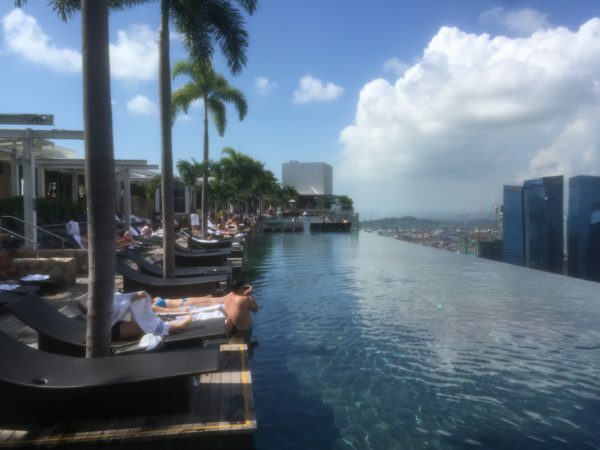 Located at the top of the luxury Marina Bay Sands Complex, the bar introduces a breathtaking view of the nearby water 200 meters above the ground. Being situated on the top of the One-Raffles Place, 1-Altitude brings up the nightlife at its finest. If there’s something you need, you will definitely find it here. 1-Altitude has a unique 3-level design, completed by extensive tree decoration, numerous bars and a dining area. Because of its wonderful location, very close to the Marina Bay, Lantern at Fullerton Bay Hotel offers amazing view and romantic atmosphere. The indoor interior is focused on bed-style seating, which makes it perfect for a romantic night out with your loved one. Enjoy an affordable drink from their menu, while experiencing the bed seating with a view. In between a mighty skyscraper stack and a garden of futuristic looking trees is what you get with your glass of alcohol when visiting Artemis Grill. Being a fairly popular spot and definitely one of our favorite Singapore rooftop bars, it’s cozy atmosphere and happy hour make it a top-choice if you’re around. With a great view over Singapore and awesome location, situated on the west end of the popular Marina Bay Sands Complex, Flight Bar & Lounge has it all – classic cocktails, fresh juices, a long list of fine craft brands, as well as some fancy alcohol beverages. Be sure to give it a go. Here you can find some amazing craft beers. The price point starts at $13 a pint. Be sure to save your places and come by before 8pm, as this is when the happy hour ends. 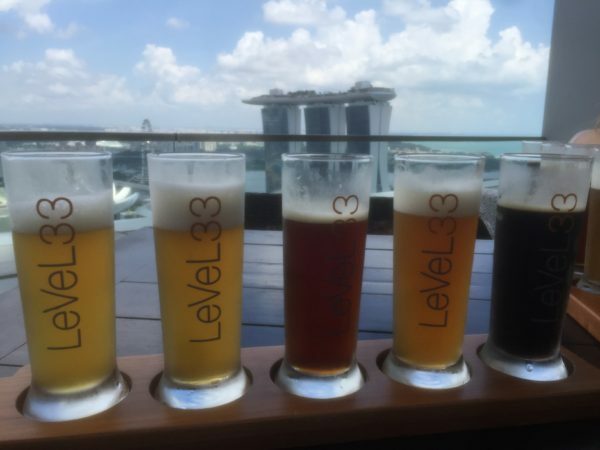 LeVeL33 is located on the outdoor terrace on the top of the Marina Bay Financial Centre. The happy hour at [email protected] indeed, makes you happy. Starting at 6pm, you can find cheaper drinks and a great combination of atmosphere, music and quality alcohol. Be sure to book ahead, as it is quite busy around that time. If you are a keen cocktails observer, The Rooftop has something for you. Be sure to try their Zombie cocktail, adding up a mixture of pomegranate, rums and absinthe. A great option of bottled cocktails, serving 5 people, can also be found on the menu. Overlooking the Singapore’s financial district, Orgo offers a strong list of fresh fruit cocktails, champagne martinis and wonderful mojitos. At Spago, you can indulge on both great cocktails and an infinity pool, overlooking the glowing Singapore lights at night. The variety of cocktails and alcoholic beverages starts at $26. Inspired by the black and white cinematic era, Smoke & Mirrors has it all. Situated on the rooftop of the national gallery, this place opens up a completely different view to the city. A fresh mixture of sparkling drinks and a 360-degree view is what you get when you first visit Southbridge. 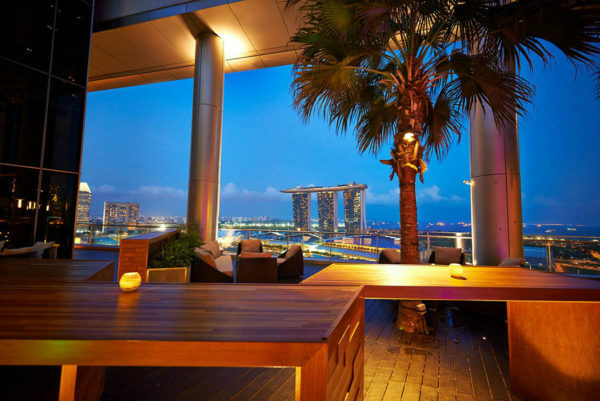 A definite favorite in our 15 best rooftop bars in Singapore, Southbridge is located perfectly to expose a skyline of the Singapore River, the Parliament house and the Asian civilizations museum. If you find yourself wondering around the Scarlet Hotel, hop on the elevator up to the rooftop. There you will find Breeze – a modern and cozy restaurant that provides a spectacular view of Chinatown. Be sure to give an extensive look and even better – try some of their cocktails. Great article, thanks for this now I have more options to spend my night. Great to know there are great places for dates like this. I love this! reminded me a lot of Singapore going out days! my favorite place was the indoor golf bar because of the beer while playing golf, oh it was nice.